The first thing to say about this book is that, despite the picture and tagline on the cover, it’s not a Christmas book. As it says, ‘it all started at Christmas’ but the story takes place over two Christmas periods with a few birthdays in between. What started that first Christmas was the developing relationship between Adam and Katie. Adam is a divorced father with an 8 year old daughter, Lily. He was brought up by his grandparents after his mother’s early death and is very close to his Grandma Grace. Although he lives some distance away, he goes to see her often and it is on one of these occasions that he meets Katie. Katie is following her dream to run a bakery and is the owner of Sweet Occasions. She lives with Steve but is starting to feel that things just aren’t right between them anymore. The only thing which didn’t quite work for me was that all the chapters were in first person. Each chapter was narrated by a different character and it said at the beginning which character it was. Of course, as I read on it became obvious whose chapter it was. However, I found on occasion that if I had put the book down mid-chapter, it took me a minute to realise which character was narrating that particular section. It’s just a personal thing of course, but I prefer only one character to be using ‘I’. A Little Sugar, A Lot of Love is a very romantic story and had some of the most emotional scenes I’ve read for a long time. I was reading on the bus when one particular scene had me swallowing very hard! A very enjoyable, heart-warming story with well developed characters you will believe in and you will be hoping they can overcome the obstacles in the way to their happiness. Then, one winter’s day, a man walks into her shop – and, in the space of that moment, the course of Katie’s life is changed. But nobody finds happiness in the blink of an eye. Sometimes it takes two Christmases, three birthdays and a whole lot of cake to get there. Hurriedly adding this to my TBR – I’ve been meaning to for ages. She’s got another new book coming soon too. Think I’m reviewing next week. 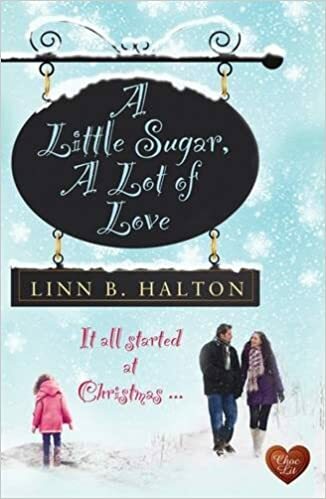 What a lovely to surprise to find in my Twitter feed this morning – thank you so much, Joanne, for taking the time to read and review A Little Sugar, A Lot of Love. And sounds like you will be reading the latest one, too – quite a marathon and very much appreciated. Have a great Wednesday! Yes your Twitter feed must be going a bit mad! I’ve read the new one too and it’s lovely. Ah, thank you – always a nerve-wracking time until I know what the reviewers think. Getting excited as launch day approacheds!